Anesthesia risks and how we manage them. 15 Jan Anesthesia risks and how we manage them. Anesthesia can be scary and we all have our preconceived perceptions of, and concerns about the risk of anesthesia. Several studies recently conducted to determine the risk of death under anesthesia in an otherwise healthy animal is estimated at 0.06% or 1/1667. This number is certainly low but I feel still not low enough therefore, anesthesia need to be tailored to the patient to help prepare for, and minimize complications. How this is accomplished is via an examination and pre-anesthesia bloodwork. To help you better understand how we tailor anesthesia for your pet below is an outline. Anesthesia occurs in several steps, with opportunities at each step to minimize risks for your pet. Anesthesia starts with an assessment of your pet’s health. 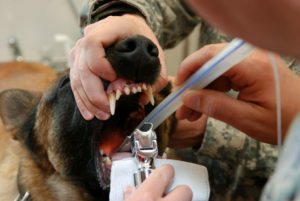 The veterinarian will assemble any needed medical history and lab results, and perform a physical exam. Here is where they could be assigning an anesthetic risk factor and determining if any specific interventions might be helpful to reduce anesthetic risk for your pet. Complications such as low blood pressure, shallow breathing, low body temperature, slow heart rate, and delayed recovery from anesthesia can all be anticipated and planned for during the assessment stage. An anesthesia plan can provide guidance for prevention, recognition and treatment of anesthetic complications. General anesthesia itself involves a combination of drugs. The pre-anesthetic medications, “Pre-meds” as they’re referred to in the hospital, have many benefits. Amongst other functions, they provide preventive pain management, reduce stress, and minimize the necessary dosages of other anesthetic drugs. Pre-meds are specifically chosen for your pet, based on his or her unique anesthesia profile. 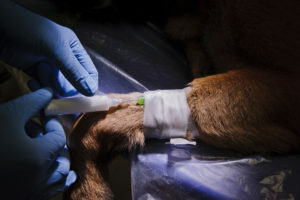 Once the animal is relaxed from the premeds, an IV catheter is put in place. This allows for the administration of IV drugs and fluids, as well as the IV induction of anesthesia, which is safer and less stressful than mask induction. Presence of an IV catheter is especially important if an emergency drug is needed to treat a complication. The patient is Pre-oxygenated to charge the lungs with oxygen and along with the IV induction step, promotes a smooth, controlled transition to unconsciousness via a short-acting anesthetic. Endotracheal intubation. Placing an endotracheal, or “breathing”, tube protects the airway and lungs from accidental inhalation of foreign material such as stomach contents, saliva, blood, water, cleaning paste, or tartar. Such a tube is also necessary to maintain anesthesia with inhalant gases. 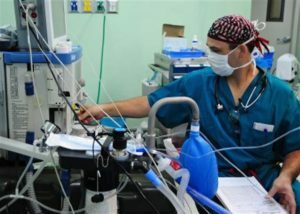 Maintenance of anesthesia with patient monitoring and support. At this point the patient is unconscious and the procedure is underway. Anesthetic gases are the most appropriate agents for maintenance of anesthesia. Monitoring of your pet’s vital signs enable recognition and prevention of complications, or timely treatment of them should they arise. Patient support might include administration of IV fluids and drugs to prevent or treat complications and warming of the patient to prevent loss of body temperature. Because the most common complications include low blood pressure, decreased heart rate, shallow breathing, and decreased body temperature, the following monitors are important to help reduce your pet’s risk during anesthesia. The surgical veterinary technician: A technician is present during the anesthetic event to monitor your dog’s vital signs and to help adjust anesthetic levels, under the direction of the veterinarian. A heart rate monitor counts your pet’s heartbeats per minute. Anesthesia and other factors, such as surgery itself, can affect heart rate. By monitoring your dog’s heart rate, your veterinarian can make anesthetic adjustments quickly. An electrocardiogram (ECG) monitors your dog’s heart rate and heartbeat pattern. It can detect abnormal heartbeats called arrhythmias. If an arrhythmia is detected, your veterinarian can make suitable changes in anesthesia. Core body temperature may be monitored, especially if your dog is undergoing a prolonged surgical procedure. Changes in body temperature can cause dangerous complications. A blood pressure monitor measures your dog’s blood pressure. When used in conjunction with other monitoring equipment, it provides detailed information on your pet’s cardiovascular condition. Pulse oximetry may be used to monitor the amount of oxygen in your dog’s blood and her pulse rate. Carbon dioxide (C02) is often monitored together with oxygen, as it helps determine if your pet is receiving the right amount of oxygen during anesthesia. Recovery. Anesthetic maintenance ends and the endotracheal tube is removed. The patient is usually transferred from the procedure room to a recovery cage, where they are kept comfortable and warm, and observed for normal return to consciousness. Because, the majority of anesthetic deaths occur during recovery from anesthesia. Your pet will be observed and cared for during this critical time period (the first 1 – 3 hours after awakening from anesthesia). Monitoring of pulse and breathing as well as temperature are important. Temperature support and continued IV fluids may be helpful for some pets. Discharge. Procedural details are discussed, instructions for post-procedural home care are reviewed, pain and/or other medications may be dispensed, and follow-up visits are scheduled. Recent improvements in anesthetic agents allow for a quick recovery, and your dog should almost be back to normal when you pick her up after the anesthetic event. She may seem more tired than normal when she goes home. This has as much to do with the stress of her visit to the veterinary hospital as to the anesthetic itself! As you can see, while anesthesia for pets is relatively safe, and far safer than it used to be, there are still steps you and your pet’s medical team can take to minimize the risk of anesthetic complications. Safe anesthesia involves multiple steps and requires knowledgeable drug choices and close monitoring and support of the pet before, during and after anesthesia. Knowing how to prepare, what to expect, and what questions to ask your veterinary team will help keep the process as painless as possible – for you and your pet. Share your concerns with your veterinarian. Be sure to mention signs of exercise intolerance (fatigue or panting). Ask whether your pet’s health or breed requires specialized anesthesia. Learn how your pet will be cared for before, during and after the procedure. How will your pet’s stress be managed? Who will check vital signs and how often? Will someone be with your pet during recovery? Find out when you need to take away food. Most veterinarians recommend no food after midnight to reduce the risk of vomiting under anesthesia and because it’s easier to breathe without a stomach full of food. Certain pets, including diabetics and very young animals, may not be able to fast that long. Ask when to expect a phone call. Veterinarians typically want their patients to arrive early the day of the procedure so they can examine them before heading into the operating room for the day. This allows the veterinary team to move smoothly from procedure to procedure, without having to stop to evaluate new arrivals. Many animal hospitals will call you once your pet has awakened. Be sure you understand and follow the discharge instructions. Most pets that have surgery go home on pain medications, so make sure you’re aware of possible side effects. Give your pet a couple of days to fully recover. Usually, pets are pretty drowsy the first night after anesthesia, and many have no interest in food. Your pet likely will be much closer to normal the next morning and back to normal by day two, although that depends somewhat on the procedure and how long your pet was under. Payment is expected at the time of service unless arrangements are made in advance. In addition to accepting all major credit cards, we offer payment options from care credit.